soup, rice noodle with green curry with coconut shoot etc. 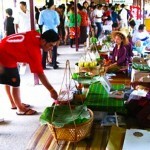 Sainoi Floating Market opens particularly on Saturday and Sunday from 08.00-17.00hrs. This floating market provides riding boat service along Khlong Phra Pimonracha from 09.30-16.00 hrs. 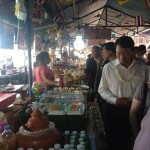 By visiting Wat Saiyai and coconut orchard with youth student as a tour guide.